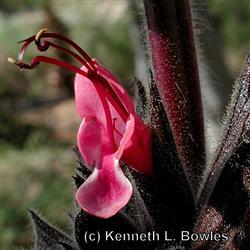 This small and compact species of sage is loved by hummingbirds and produces beautifully fragrant foliage and flowers. The flowers can range anywhere from a dark red to a a neon pink Flowers are held on large spears that emerge from the center of the plant. This Salvia loves afternoon shade and does well in forest floors and in understory locations. They thrive in clay soil and part shade. The plant spreads by rhizomes and will spread once established. A perfect plant for the dry shade conditions under oaks. This sage has an amazing scent which reminds me of Hawaii and pineapples. Hard to describe the smell so I would highly recommend to try one of these plants. It certainly does attract hummingbirds and bees.